Magnetic Sine Plates for High-Precision Machining - Hermann Schmidt. 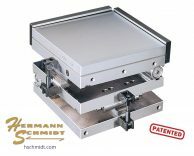 Hermann Schmidt offers a wide variety of high precision magnetic sine plates for manufacturing environments requiring the highest standard in quality. Our patented fixtures can be used in various manufacturing functions, including: grinding, sinker edm, and inspection.